There is always risk in releasing an album of “covers”. First, the possibility always exists that the material is too familiar to attract much attention. Second, there is the risk of being unfavorably compared to the earlier versions of the material being covered. After Hours mostly avoids the first risk by focusing on material from before 1973, ensuring that most of the audience will not be terribly familiar with the material. The second risk is more problematic as there are some definite misfires in the tempos at which some of the songs are performed. The album opens with “Welcome To My World”, a ballad generally associated with either “Gentleman” Jim Reeves or Dean Martin, two of the premier balladeers of the twentieth century. Jim Reeves had a smooth, velvety voice capable of conveying warmth like few others (Bing Crosby, Dean Martin, Ray Price) ever could. Dean Martin was the King of Cool with great warmth but a more casual feel to his vocals than Reeves could achieve. If you have not heard either Reeves or Martin perform this song, then you will really like Malo’s performance. Raul does not have the warmth of his predecessors, but does an admirable job with the song and the accompaniment is excellent. “(Now and Then) There’s A Fool Such As I” is a slight misstep, taken at a tempo that is too fast and bouncy for the sad lyrics. This song was a big hit for Hank Snow in 1952 and was covered by some guy named Elvis Presley (himself a big Hank Snow fan) a few years later. A honky-tonk style piano takes a break in the song but the basic arrangement is big band swing. Malo gets back on track with the Kris Kristofferson classic “For The Good Times”, a song which revitalized Ray Price’s career in the early 1970s. Again, I prefer Ray’s version, but Raul’s take is very nice. The two newest songs on the album come from the pen of Dwight Yoakam. The first of these is “Pocket of A Clown”, a song that just missed the top twenty for Dwight in 1994 (it reached #4 on the Canadian country chart). Raul’s arrangement is a little slower than the original and has a 40s/50s feel to the horn arrangements. “Crying Time” was written by Buck Owens, who regarded the song as album filler. A few years later Ray Charles resurrected the song causing Buck to add it to his set list (usually as part of a medley). It’s a great song, and Malo does it justice, although he can’t deliver it with the same soul that Ray did (no one else could either). “You Can Depend On Me” is the oldest song on the album written sometime before 1931 by Charles Carpenter, Louis Dunlap and jazz piano great Earl “Fatha” Hines. The song was recorded by the likes of Louis Armstrong, Count Basie and Nat King Cole. In 1961 Brenda Lee took it to #6 on the pop charts. Malo handles this song quite effectively. The basic arrangement would be that of cocktail lounge jazz. My favorite song on the album is “Husbands and Wives”, which was written by Roger Miller and went top five country, #2 adult contemporary and top thirty pop for Roger in 1966. Subsequently, the duo of David Frizzell and Shelly West had a top twenty county hit with it in 1981, and Brooks & Dunn took it to #1 country and #36 pop in 1998. This song features steel guitar as part of the instrumentation, the only truly country sounding song of the album. For me, it as a toss-up whether Neil Diamond’s album track from his 1971 album Stones or Raul’s version on this album is my favorite version of this song. Speaking of Roger Miller, one of the last songs Roger wrote was a co-write with Dwight Yoakam on “It Only Hurts Me When I Cry” a #7 country hit for Yoakam in 1991. Again, Malo uses an arrangement very similar to Dwight’s original and performs the song well. There are horns on this track and they serve to create a swinging effect, even though the tempo is no faster than the Yoakam original. The album closes with a very nice rendition of the Hy Heath-Fred Rose composition “Take These Chains From My Heart”, best known as a posthumous #1 hit for Hank Williams in 1953, and in 1963, a #8 pop hit Ray Charles (Ray’s version also reached #5 in the UK). The accompaniment on this final track starts out with just a single guitar then expands with the subsequent verses, but remains at all times uncluttered, with tasteful saxophone and piano solos between the vocals. After Hours is an enjoyable album which I would rate as good, but not great, as it is marred by the tempo errors noted above. Malo is in good voice throughout and he is accompanied by what could be essentially described as a jazz quintet of himself on guitar, Robert Chevrier on piano, Jay Weaver on bass, Tom Lewis on drums and Jim Hoke on sax, clarinet and steel guitar. The album was recorded live, with only Hoke being overdubbed occasionally (it’s tough to play three instruments simultaneously). Malo and producer Evan York, keep the focus on the melodies and lyrics, never obscuring either. Being related to a famous country entertainer can be a mixed blessing. Although the family ties can open doors for the aspiring singer, they can also serve to set unrealistic expectations. Just ask Roy Acuff Jr., Ronnie Robbins (billed as Marty Robbins, Jr.), The Lynns (daughters of Loretta Lynn), Riley Coyle (daughter of Jeannie C. Riley), Pake McEntire (Reba’s brother), Jay Lee Webb (Loretta Lynn’s brother), Peggy Sue (Loretta Lynn’s sister), and Hillman Hall (Tom T. Hall’s brother), each of whom issued an album or two and then disappeared. John Carter Cash has avoided the problem entirely by working behind the scenes. Then there are those who achieve modest success and carve out respectable careers but never achieve top-drawer status, such as Shelly West (daughter of Dottie West), David Frizzell (brother of Lefty Frizzell), Tommy Cash (brother of Johnny Cash), Carlene Carter (daughter of Carl Smith and June Carter) and Thom Bresh (son of Merle Travis). Jazz guitarist Lenny Breau, son of country stars Hal Lone Pine and Betty Cody, might have fit into this category had he not died young. True superstar success for those with famous kinfolk is indeed rare. The three biggest that come to mind are Crystal Gayle (Loretta Lynn’s sister), Lynn Anderson (the daughter of songwriter Casey & singer-songwriter Liz Anderson) and Hank Williams Jr. Pulling up behind these three are George Morgan’s daughter Lorrie, Rosanne Cash and this month’s spotlight artist, Pam Tillis. Pamela Yvonne Tillis was born on July 24, 1957 in Plant City, Florida, the daughter of singer-songwriter-actor-comedian Mel Tillis. As the daughter of one of the best-known songwriters around, and living in Nashville, Tillis was exposed to the elite of the country music industry even before her father had achieved recording star status. She made her Grand Ole Opry debut at the age of eight in an appearance with her father singing “Tom Dooley.” She grew up wanting to be a performer and tried her hand at songwriting at an early age and also found some work as a background singer. The results of an automobile accident at age 16 derailed her career for a while as several years of reconstructive facial surgery were needed to restore her appearance. Following her surgeries, Tillis enrolled at the University of Tennessee; then later at Belmont University in Nashville, TN, forming her first band. Since her only real interest was music, she eventually dropped out of college to pursue her own musical career. Wanting to make it “on her own,” Tillis went to San Francisco where she joined a jazz-rock band Freelight. After tiring of the San Francisco scene, she returned to Nashville and found work as a demo singer. She signed with Warner Brothers. in 1982, where she took a shot at pop success. Her sole album for Warner Brothers was Above and Beyond The Doll of Cutey. During the period between 1983 and ’87, Warner Brothers would issue at least eight singles on Tillis, five of which charted on Billboard’s Country chart, although none made the Top 50–not surprising since they were not being marketed as country singles. Unreleased were early versions of several of her later hits, which were released after she achieved success. During this period, Tillis signed on as a staff songwriter with Tree Publishing in Nashville, where she shifted her focus to contemporary country music and achieved much success as a songwriter, with artists as diverse as Chaka Khan, Martina McBride, Gloria Gaynor, Conway Twitty, Holly Dunn, Juice Newton, Sweethearts of the Rodeo, Dan Seals, and Highway 101 recording her songs. Her visibility was greatly improved when she started making regular appearances on shows aired on the late lamented Nashville Network, especially on Nashville Now, a nightly variety show hosted by Ralph Emery. By 1991 she had signed with Arista Records, where her career took off. For part of this period (until 1998) she was married to fellow songwriter Bob DiPiero. After 1998, the hits started drying up as the next wave of young performers arrived. Tillis’ Arista albums were generally quite successful, starting with 1991’s Put Yourself In My Place which had three Top 10 hits in lead single, “Don’t Tell Me What to Do,” “One of Those Things” and “Maybe It Was Memphis.” The album ultimately reached gold status. In 1994, her third Arista album, Sweetheart’s Dance, was released, reaching #6 on the Billboard’s Country Album chart (her highest placement). Singles “Spilled Perfume” and “When You Walk in the Room” both became Top 5 hits and she had her only #1, “Mi Vida Loca (My Crazy Life),” helping push the album to platinum status. Issued in late 1996, All of This Love, became Tillis’ last gold non-compilation album. The only single to reach Top 10 status was “The River and The Highway.” It was the first album she produced on her own. In 1997, Arista released her first (actually only) Greatest Hits album. The compilation featured two new tracks, both released as singles: “All the Good Ones Are Gone” and “The Land of the Living,” both of which reached the Top 5 in 1997. This collection also went platinum. After 1997, the country music market shifted, becoming more youth-oriented and less country, with a resultant drop in both chart and sales success for Tillis. Her 1998 album Every Time featured “I Said A Prayer”, which just missed the Top 10 and was her last Top 20 single. Her last Arista album, issued in 2001, Thunder & Roses performed reasonably well on the album chart (both it and Every Time reached #24) but generated no real hit singles. Since 1998 Pam Tillis has remained active, both in live appearances, occasionally performing with her father Mel, and occasionally recording. She became a Grand Ole Opry member in 2000, which was several years before her father, and had the honor of inducting him into Opry membership. She has tried her hand at acting, both on stage and on television, with considerable success. She still records occasionally. In 2002 she fulfilled a lifetime dream of recording an album of songs written by or associated with her father. Titled It’s All Relative, the album found Pam ignoring the Mel Tillis template and giving her own interpretation of her father’s material, most notably on “Heart Over Mind”. She started her own record label, Stellar Cat, and issued her album Rhinestoned under that imprint in 2007. One of the singles from the album, “Band In The Window,” earned considerable acclaim, although the album ultimately yielded no hits. All told, Pam Tillis had over 30 chart records including 13 Top 10s. In 1994 she was named the Country Music Association Female Vocalist of the Year. In 1999, she earned a Grammy Award for Best Country Collaboration with Vocals. When CMT did their countdown of the 40 Greatest Women of Country Music in 2002, Tillis ranked at #30. Kevin Coyne of Country Universe ranked her at #35 in his 100 Greatest Women of Country Music countdown in 2008. With the exception of the Warner Brothers album, which originally was issued on vinyl and audio cassette, all of Tillis’ subsequent recordings have been released on CD. Most of the titles remain in print, others can be located used with a little bit of effort. Unlike country singers from generations before, the Pam Tillis catalog is fairly shallow with a total of a dozen original studio albums, plus some anthologies (Greatest Hits, Super Hits, Best Of, etc.) and whatever unreleased tracks may be lying around in somebody’s vault. Accordingly, collecting a fairly complete Pam Tillis collection isn’t that difficult, especially since her Warner Brothers debut recently was reissued on CD by Wounded Bird. All of her post-Warner Brothers albums are worthwhile and even her debut album (which I originally purchased on vinyl) has its moments. The Ernest Tubb Record Shop currently has seven of her albums available as well as several anthologies. There is a need for a decent two-disc set containing about 40 of her songs. Lately, the German label Bear Family has been issuing some less-than-exhaustive sets. Maybe they will step up to the plate –she’s worth a decent anthology. Pam Tillis is still actively performing – you can catch up with her at her website http://www.pamtillis.com/ . She does have some product for sale there as digital downloads including a Christmas album and a duet single (with Kris Thomas) titled “Two Kings” which is about Elvis Presley and Martin Luther King, Jr. Her long-awaited duet album with Lorrie Morgan comes out later this month. The 1980s were a mixed bag, with the early 1980s producing some of the lamest country music ever recorded, as the Urban Cowboy movie wreaked havoc on the genre. Fortunately, there was still good country music being released. The first flowering of the late 1980s “New Traditionalist” movement arrived in 1981 with the first hits of Ricky Skaggs and George Strait, but they remained outliers until 1986 as far as good new artists were concerned. The latter part of the decade, however, produced some truly excellent country music with the 1986 arrival of Randy Travis and company. This list is meant neither to be a comprehensive list of great country songs from the 1980s, nor any sort of ranking of records. It’s just a list of some songs that I liked and remember. See if you recall any of these records. Rosie’s never had much chart success but this self-proclaimed ‘Rockabilly Filly’ is a popular concert draw and a dynamic live performer. This song was her career chart highwater reaching #51 in 1987. Katie, Kim, June and Christie had a five year run of top ten hits from 1985 through 1989 with fourteen straight top ten records, including this song, their second of five number one records . Released in 1985, this topped the charts in early 1986. Songwriters Radney Foster and Bill Lloyd joined forces as a duo in 1987. This was their first and biggest chart record reaching #4 in the summer of 1987. This 1986 #1 was her ninth (and last) #1 record. This bluesy number was an excellent record coming after a long string of successful but insubstantial fluff. A former session singer, Janie’s career hit high gear during the 1980s, a decade which saw her tally 26 chart records with 17 top ten records and eight #1s. A younger brother of both Lefty and David Frizzell, Allen today writes and sings predominantly Christian music, although he will perform a Lefty Frizzell tribute (omitting Lefty’s rowdier songs). This song charted in 1981 – the follow up was titled “She’s Livin’ It Up (and I’m Drinkin’ ‘Em Down)”, neither of them songs Allen would dream of performing today. The early 1980s were David Frizzell’s commercial peak, both as a solo artist and as part of a duet with Shelly West. This unforgettable 1982 novelty was David’s sole #1 record, although my personal David Frizzell favorites were the follow up “Lost My Baby Blues” and his 1999 recording of “Murder On Music Row”. After a dominant streak from 1975 in which seven songs reached #1 on one or more of the major charts, Larry and his brothers hit a rough patch in which their singles charted, but few reached the top ten. Finally in late 1983 this song reached #1, and kicked off a brief resurgence fueled by a large infusion of western swing. The two records that followed this record (“Denver” and “The Lady Takes The Cowboy Every Time”) would have made Bob Wills proud. Crytal Gayle had a run of thirty-four top ten records that ran from 1974 to 1987. I’m not that big a Crystal Gayle fan but I really liked her 1982 duet with Eddie Rabbitt which reached #1 country / #7 pop. Released in 1980, this song peaked at #8 (#13 pop / #3 AC) in early 1989. Blind since birth, Terri really wasn’t a country singer and soon headed to gospel music . This was her biggest hit, one of four top twenty records. Not a big hit, this was Don’s next-to-last chart record, reaching a peak of #42 in April 1980. Don’s chart career ran from 1956-1981. His influence as a songwriter is still felt today. Mickey Gilley was a second cousin to Jerry Lee Lewis and Jimmy Swaggart as his piano playing amply demonstrates. This song reached #1 in 1981. Mickey’s long string of hits consisted of some original material (such as this song and “Doo-Wah Days”) and some covers of pop hits such as his next record “You Don’t Know Me” (a cover of a Ray Charles hit covering an Eddy Arnold hit) and prior hits “True Love Ways” and “Stand By Me”. Jimmie Dale Gilmore looks like a renegade hippie from the sixties and sounds like one of my honky-tonk specialist from the fifties. He’s never had much chart success (this song reached # 72 in 1988) but his albums are terrific and his vocals solid country through and through. Probably the most underrated performer of my generation. A part of the famous trio Tompall and The Glaser Brothers, Jim’s voice was midway in range between brothers Chuck and Tompall with significant overlap on both ends. Also, Jim was part of the vocal trio on Marty Robbin’s classic hit “El Paso” and wrote the pop hit “Woman, Woman” (#4 pop hit for Gary Puckett and The Union Gap). Jim released a number of chart records under his own name form 1968-1977, but his real success began after Tompall & The Glaser Brothers split up (again) in 1982 and Jim signed with Noble Vision Records. After the first three records for Noble Vision went top thirty, this 1984 single reached #10. The follow up “You’re Getting To Me Again” went to #1 but then Noble Vision started having financial problems. Jim would subsequently sign with MCA in 1985 but the momentum had been lost (not to mention that by then Jim was already 47 years old). Tompall and The Glaser Brothers were one of the most impressive live singing groups to ever take the stage. Unfortunately, their stage show did not translate into recording success. The group was together from 1959 until about 1974, recording many fine records but only one top ten hit in “Rings” which reached Record World’s #1 slot in 1971. The group briefly reunited in 1980 and had their career record with this Kris Kristofferson song which reached #2 Billboard / #1 Cashbox in 1980. Recorded for the small AMI label, this gem reached #10 in early 1983, just as AMI was going down the toilet. It’s hard for me to pick out just one favorite Vern Gosdin song, but this one would be in my top three. From here Vern would go to another small label Compleat where he would have his biggest hit in 1987’s “I Can Tell By The Way You Dance (You’re Gonna Love Me Tonight”). Mark Gray and Vince Gill were the two young male singers most highly touted to make it big in the early 1980s. Both were associated with bands that had some success (Mark was a member of Exile for a few years, Vince a member of Pure Prairie League). Then Nashville took a traditionalist turn leaving Gray, not as versatile a performer as Vince Gill, stranded. Still, Gray almost made it. This song was Gray’s third top ten record, reaching #9 in late 1984. The follow up “Sometimes When We Touch”, a nice duet with Tammy Wynette reached #6. Then came the Randy Travis, Dwight Yoakam, et al floodwaters of 1986. Nice 1981 cover of a #1 pop hit for Percy Sledge in 1966. This song peaked at #18 in early 1982. This was Grayson’s only top twenty recording out of thirteen charted records. This 1983 single barely cracked the top 100 for Jack but it was a pretty good recording that probably would have been a big hit had Jack recorded it a dozen years earlier. This was Jack’s thirty-third chart record. He would have three more before fading off the charts for good. His 1966 single was #1 for seven weeks in 1966-1967 and was the CMA Single of The Year in 1967. Jack also took home the Male Vocalist honors for 1967. Jack is now 82 years old and still performs, but mostly on the stage of the Grand Ole Opry. This single reached #6 in 1983, his fourth consecutive top ten single, and still my favorite Lee Greenwood song. Lee was the first artist to record “Wind Beneath My Wings” and had it planned as the second single from the I.O.U album. Gary Morris dashed into the studio and got his version recorded and released before “I.O.U.” finished its chart run. Lee’ version was better (and better than the pop version that came out in 1989). Nanci is a fine songwriter/poet having written many fine songs. As a singer, she’s not much. This song reached #36 in 1987, her biggest chart hit of the 1980s. She did a nice recording of “Love At The Five & Dime”, but even that song was better in a cover version, as recorded by Kathy Mattea. Nine years after her last chart entry and twenty years after her last top forty recording , country music’s ‘Renaissance Woman’ snuck onto the charts in 1989 with a nice version of a Bob Dylan song. Marty’s career almost ended before it started when he picked up a hitch hiker who shot him and left him for dead. A long recovery followed with an extended period of recovery. This song reached #57 in 1988 for the soon to be defunct MTM label. Written by Paul Overstreet and Thom Schuyler, this song was recorded by a number of artists including George Strait on his 1992 album Holding My Own. 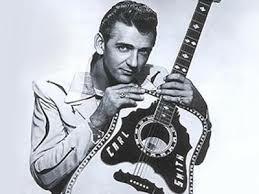 Marty’s version is better and would have been a big hit had it been released in 1958 rather than 1988. This was Merle’s 100th chart single reaching #4 in 1989. What else is there to say? Tom T. Hall’s days as a hit maker were largely over by 1982 and Earl Scruggs never was a hit maker – he was of far greater importance than that. These two music masters combined for a wonderful album titled The Storyteller and The Banjo Man in 1982 from which emerged this single. Alabama would have a big hit with this song a few years later but the Alabama version lacks the personality and charm of this rendition. The only chart record for the son of George Hamilton IV, this tune reached #75 in early 1988. A cover of Darrell’s 1974 hit, this version peaked at # 64 in early 1983. This 1983 recording was the only solo top ten for the smoky voiced Ms. Hardin. A longtime favorite in Tulsa, Gus broke through with a major label contract (RCA) and charted eight solo singles and two duets. Released in 1984, her duet with Earl Thomas Conley “All Tangled Up In Love” peaked at #8 in early 1985. Her 1985 duet with David Loggins “Just As Long As I Have You” reached #72. Emmylou had 26 top ten recordings between 1975 and 1988. This 1983 live cover of Hank Snow’s 1950 hit (in fact, the biggest chart hit in the history of country music) reached #5. During the 1980s, most of Emmylou’s best recordings were duets – “That Loving You Feelin’ Again” (with Roy Orbison) and “If I Needed You” (with Don Williams) come readily to mind, but there were more. After a hugely successful first half of the 1970s, Freddie hits got progressively smaller. By 1979 Freddie had been dropped by Capitol and signed by Sunbird, the same label that launched Earl Thomas Conley. The label failed to re-launch Freddie’s career but did provide a few good recordings, including this song, which reached #15 in 1980 and would prove to be Freddie’s last top twenty hit. Just when it seemed that the ‘Gulf & Western’ subgenre had been strip mined of hits by Jimmy Buffett, along comes this nostalgic hit which became a #8 pop hit in 1982 (topped out at #50 on the country chart). Highway 101 exploded onto the country music scene in January 1987 running off a string of ten consecutive top tens through early 1990. This one is my personal favorite with Paulette Carlson’s voice seemingly tailor made for the song, which reached #2 in 1987. Typical story – Carlson left the band in late 1990 seeking solo stardom and the band never recovered its momentum (plus Carlson did not succeed as a solo act). I was torn between this song and one of the group’s #1 hits “Somewhere Tonight”. The inability of the Hobbs to break through at radio has always bugged me. Other than a duet with Moe Bandy (“Let’s Get Over Them Together” – #10 in 1983), Ms Hobbs was unable to break the top thirty. The closest she got was this song, which peaked at #31 in 1988. David’s 60th (and next to last) chart record, this recording peaked at #69 on the small Excelsior label in 1981. This was a pretty good western swing record. Houston would have one more chart record in 1989. His 1966 hit “Almost Persuaded” was (according to Billboard) the biggest chart record of the last fifty years, spending nine weeks at #1. #84 in 1983 – what more need I say. Engelbert is one of the truly great vocalists of my generation. His greatest decade was the 1960s when he made international huge pop hits out of country classics such as “Release Me”, “There Goes My Everything” and “Am I That Easy To Forget” as well as covering other country songs on his albums. This song peaked at #39 in 1983. This cover of a Chi-Lites hit from 1972 reached #12 in 1982 and featured the Oak Ridge Boys on backing vocals. Con’s voice was too smoky and too distinctive to have achieved much success during the early 1980s but this was a fine recording, even if not very country. Con’s biggest hit came the year before when “What’s New With You” peaked at #11. This song reached #35 in 1982. Her biggest hit was “Don’t Come Knocking” which topped out at #28 earlier in the year. Cindy charted seven records between 1981 and 1983, then disappeared. One of the hottest male-female duet acts of the early 80s, David Frizzell and Shelly West released four studio albums together. None of them ever had a CD release, nor are they currently in print. However, this 2009 anthology includes all of their big hits, plus a few misses and some key alubm cuts, and provides a more than adequate overview of their duet career. The younger brother of Lefty Frizzell, David had had a singles deal with Columbia from 1970 to 1976. Only one of those recordings, 1970’s “I Just Can’t Stop Believin'” (not included in this collection) cracked the Top 40; the rest languished in obscurity on the lower rungs of the charts. His younger brother Allen joined his band in 1977. Alan had been the lead guitarist for Dottie West, and had married West’s daughter Shelly. Shelly began performing with David, and eventually they caught the attention of producer Snuff Garrett. Their big break came in 1981 when their recording of “You’re The Reason God Made Oklahoma” was included in the Clint Eastwood film Any Which Way You Can. The song was written by the legendary Felice and Boudleaux Bryant, along with Larry Collins and Sandy Pinkard. It reached the #1 spot on the Billboard country singles chart. It was the duo’s biggest hit, telling the story of a couple dealing with a painful separation when one of them leaves their hometown for the bright lights of the big city. It’s a theme that the duo would explore a number of times, beginning with their follow-up hit “Texas State of Mind”, which peaked at #9 and the following year’s “Another Honky-tonk Night On Broadway”, which reached #8. Of the three songs, it isn’t difficult to see why “Oklahoma” is the best-remembered (the other two have been virtually forgotten); it is the best-written of the three songs and also managed to avoid some of the early 80s production excesses that marred the other two records; there is a somewhat intrusive string section on “Texas State of Mind”. While this is less of a problem on “Broadway”, “Oklahoma” sounds the least dated and would stand a reasonable chance at success today with very little tinkering to the arrangement. In between “Texas State of Mind” and “Another Honky-tonk Night on Broadway”, Frizzell and West did an excellent cover version of Roger Miller’s “Husbands and Wives”, which peaked at #16. One of Miller’s more serious efforts, his original 1966 version had reached #5, as well as reaching #26 on the Hot 100. Brooks & Dunn would cover it again in 1998 and take it all the way to #1 on the country charts. Their version also reached the Hot 100, peaking at #36. Frizzell and West stopped recording together after 1985. It was speculated that West’s acrimonious divorce from Allen Frizzell was a contributing factor, but the rest of the songs in this collection — and their performances on the charts — suggest that the official reason, a lack of good duet material, was probably the truth. The duo had only one more Top 10 hit, 1982’s “I Just Came Here To Dance”, a cover of an R&B hit by Peabo Bryson and Roberta Flack. The Frizzell and West version is barely country, yet managed to reach #4. Their next release, the decent but somewhat overproduced “Please Surrender” only reached #43. 1983’s “Cajun Invitation” was a song that I liked a lot when it was first released, but it sounds very cheesy today. The duo reached the Top 20 two more times in 1984 with the beautiful “Silent Partners” and “It’s a Be-Together Night”. Their final single together “Do Me Right”, released in 1985, failed to chart at all. The collection does not include any of David or Shelly’s solo hits, which is a shame, because there is sufficient room on the disc for “I’m Gonna Hire a Wino To Decorate Our Home”, “Lost My Baby Blues”, “Jose Cuervo” and “Flight 309 To Tennessee”. It does, however, include one solo performance by Shelly of “I Just Fall In Love Again”, which is very good, though it does not compare with Anne Murray’s version that topped the country charts for three weeks in 1979. David and Shelly’s careers — as a duo and as solo artists — were largely over before the CD era, so very little of their work was ever released in that format. This collection appears to about the best that is currently available, and will suffice for all but the most die-hard fans. This duo’s pedigree was impressive; he was the younger brother of the legendary Lefty Frizzell, while she was the daughter of Dottie West and the wife of another Frizzell brother. Together they charted 11 singles on the Billboard country charts between 1981 and 1985, the first and best known of which was “You’re The Reason God Made Oklahoma”. That #1 single had been featured in the Clint Eastwood film Any Which Way You Can, and released on the Viva label, which was distributed by Warner Bros. They were awarded the CMA’s Duo of the Year trophy twice, and both Frizzell and West scored some solo hits during this period, though neither’s career was to enjoy any longevity. Shelly’s divorce from Allen Frizzell may have been partially responsible for the end of her professional relationship with David. The most commercially successful of the duos we’re spotlighting this month, the story of this mother-daughter act is well known. Record producer Brent Maher’s daughter was hospitalized and under the care of nurse Naomi Judd in the early 1980s, which provided the opportunity for Naomi to give Maher a demo tape, leading to a live audition and on-the-spot signing with RCA/Curb. The Judds were an immediate success, scoring 15 #1 singles between 1983 and 1990. During that time, they also won seven Academy of Country Music awards, nine CMA trophies, and five Grammys. A bout with Hepatitis C prompted Naomi’s retirement in 1991, while Wynonna went on to enjoy a highly successful career as a solo artist. During the 20 years since Naomi’s retirement, the two have occasionally reunited in concert and in the studio. Sisters Kristine Arnold and Janis Gill sang together as children in California and began performing as The Oliver Sisters when they were teenagers. They later renamed their act after the title of the classic album by The Byrds. Both women married musicians; Kristine’s husband is Leonard Arnold of the band Blue Steel, while Janis is the ex-wife of Vince Gill. The Sweethearts of the Rodeo signed with Columbia Records in 1986, and for a brief time were one of the hottest acts in country music. Their debut single “Hey Doll Baby” peaked just outside the Top 20. Their second single “Since I Found You” reached the Top 10. Six more Top 10 hits followed. Though they were never top record sellers, they were staples at country radio in the late 80s. Their first two albums for Columbia racked up a number of radio hits, but after that the hits began to taper off. After two more albums failed to generate any more hits, Columbia dropped the Sweethearts from its roster in 1992. They re-emerged the following year on Sugar Hill Records, for whom they recorded two critically acclaimed albums in 1993 and 1996. Jamie O’Hara and Kieran Kane recorded three albums for Columbia between 1986 and 1990. Six of the nine singles released during that period charted in the Top 10, including their best known hit “Can’t Stop My Heart From Loving You”, which reached the #1 spot in 1987. Jamie, a native of Toledo, Ohio, had penned “Older Women”, which had been a #1 hit for Ronnie McDowell in 1981 and The Judds’ signature hit “Grandpa (Tell Me ‘Bout The Good Old Days)”, which won a Grammy for Best Country Song in 1986. The two met while working as songwriters for the same publishing company. They disbanded in 1990 and resumed their solo careers. Brooklyn-born Kane eventually went on to become one of the founders the independent Dead Reckoning Records. Country rockers Radney Foster and Bill Lloyd recorded three albums together for RCA between 1987 and 1990, and in the process scored nine charting singles, four of which reached the Top 10. Prior to landing their own record deal, they wrote “Since I Found You”, which became the breakthrough hit for The Sweethearts of the Rodeo. Foster & Lloyd’s biggest hit was 1987’s “Crazy Over You”, which rose to #4. Perhaps a bit too offbeat for conservative country radio in the late 80s, they were more of a critical, rather than commercial, success and disbanded in 1990. Lead vocalist Radney Foster subsequently signed with Arista Records and enjoyed a moderately successful solo career, while Bill Lloyd went back to earning a living as a session musician. They reunited in 2011, with the release of It’s Already Tomorrow, their first album together in over 20 years. As always, we hope that this spotlight will provide our readers with a pleasant trip down memory lane, or perhaps inspire them to explore music that they may have overlooked or are too young to remember. Few things satisfy a country music fan more than when two of one’s favorite solo performers announce plans to go into the studio and record together. Country music has a long and rich history of producing collaborations with such great chemistry that they threatened to overshadow the solo work of the same artists. Perhaps that’s why we don’t see country music stars pairing up to do duets on a regular basis anymore. Nowadays, Tim and Faith, or Reba and Vince, or Kenny and Dolly, will make guest appearances on one another’s albums but they generally don’t make duet albums anymore – or if they do, it’s a one time or very occasional special event. Today, a duo is more likely to be two performers that perform exclusively together as an act – i.e., Brooks & Dunn, Sugarland, or Joey + Rory, as opposed to the old days when Conway and Loretta, George and Tammy, and Porter and Dolly regularly released duet albums concurrently with their solo work. Growing up I can remember listening to such classic pairings as Waylon & Willie, Waylon and Jessi, Kenny Rogers and Dottie West, and David Frizzell and Shelly West, in addition to the aforementioned Conway and Loretta, and George and Tammy. And then later, there were duos that collaborated less frequently, like Kenny and Dolly, Travis Tritt and Marty Stuart. Most of the Porter and Dolly duets were out of print and off the radio by the time I got into country music, but when some of their work was finally released on CD, it was like finding a long lost treasure. Who are some of your favorite duos?